Some new work at last! Told you I was doing some. I loved working on this piece as the client's ideas where so cute and fun and she was lovely to work with to boot. When in the first email she requested penguins I knew it would be a fun project! 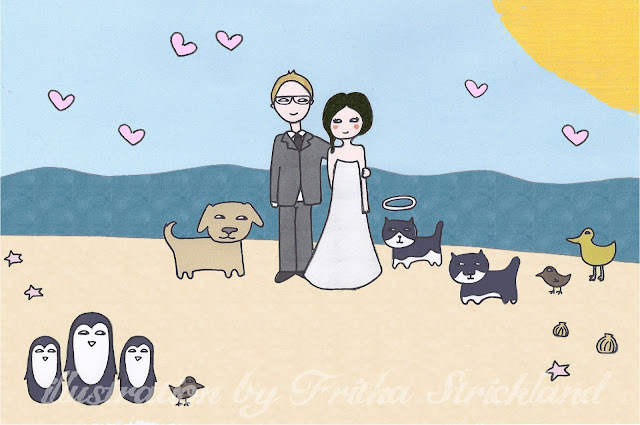 If you are interested in a custom wedding invite you can see my prices here. so cute!!! I bluddy love penguins. own blog (well, almost...HaHa!) Excellent job. Hello there! I could have sworn I've been to this blog before but after going through a few of the articles I realized it's new to me.